We had all loved Charlie on Boardwalk Empire. We knew that he had the charm and the charisma but also could go to a darker place. When he came in for his audition, he just had a fascinating take on the character. It wasn’t quite the direction we were going in but it was so nuanced and well thought out that we called him back in and we talked to him and made some adjustments and he made fantastic adjustments and he had such a depth of character that we really responded to. 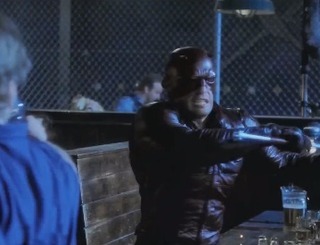 He can exude such inner turmoil and pain that is really vital to Matt Murdock, not to mention the fact that when you’re looking for a lead, you really want number one on the call sheet to be somebody that people respect and want to be around for 14 hours a day and Charlie is just the nicest guy in the world. Really, the reason we start with this version — which is hugely influenced by Man Without Fear — is for two reasons. One, this really is the beginning, the formation of Matt Murdock a Daredevil. On the flip side, it’s the formation of Wilson Fisk becoming Kingpin. It’s very much a parallel arc. We didn’t want to start him in the [red] suit. We wanted the early days of him figuring out what he was doing and making mistakes and getting the crap beat out of him on a regular basis. His suit, which we call his vigilante outfit, in the beginning – we tried practically everything, design-wise. We experimented with a lot of different head pieces. One version was a ski mask with the eyes sewn shut. We tried everything until we found something that just felt right. And also, really going back to that Man Without Fear, I can’t say where his costume ends up, where it goes, but there is definitely an evolution. I always loved in the comics that also this is a guy that has heightened sense but no super powers. This is a guy who’s pushing himself to the limit who can get hurt and can get killed… I’m hugely influenced by the Frank Miller runs that I grew up with, where he was constantly getting the crap kicked out of him. Again, obviously there’s a bit of a heightened sense of reality that he can do what he can do and not end up in the hospital every other day. But we also touch upon why that is. Really, it’s like Batman without the money. He is just determined. It’s sheer force of will that keeps him going when a normal man would fall over and a lot of that I think, also in the Matt Murdock mythos, comes from his father and being a boxer and that kind of thing, where you just don’t quit. WhatCulture! further breaks down the trailer. More on the upcoming Marvel shows on Netflix here. Posted in Science Fiction, Television. Tags: Batman, Boardwalk Empire, Daredevil, Jessica Jones, Krysten Ritter, The Matrix. RSS feed for comments on this post.. TrackBack URL.